Controlling Wind and Water Erosion – armor protects soil from wind and/or water as it moves across the soil surface. It holds the soil in place along with valuable soil organic matter and nutrients. Evaporation Rates – armor reduces the soil evaporation rates, keeping more moisture available for plant use. Soil Temperatures – armor helps soils maintain a more moderate range of soil temperatures, keeping soil warmer in cold weather, and cooler in hot weather. Like us, the soil food web functions best when soil temperatures are moderate. Compaction – rainfall on bare soils is one cause of soil compaction. When rainfall hits the armor instead of bare soil, much of the raindrop energy is dissipated. Suppresses Weed Growth – limits the amount of sunlight available to weed seedlings. Habitat – provides a protective habitat for the soil food web’s surface dwellers. Biological disturbance, such as overgrazing, which limits the plants ability to harvest CO2 and sunlight. Chemical disturbance, such as over application of nutrient and pesticide, can disrupt the soil food web functions. 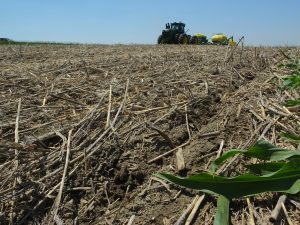 Physical disturbance, such as tillage, which we will focus on in this article. A typical soil is approximately 45% mineral (sand, silt, and clay), 5% soil organic matter, 25% water, and 25% air. The water and air portions exist in the pore spaces between the soil aggregates. Over time, tillage implements reduce and remove the pore spaces from our soils; restricting infiltration and destroying the biological glues which hold our soils together. water erosion; transporting soil, nutrient, and water to offsite locations, which negatively impacts water quality and quantity. wind erosion; transporting soil, and nutrient to offsite locations, which negatively impacts air quality, human health, and animal health. ponding water; which stays saturated on the surface for long periods of time, a result of reduced infiltration and increased runoff. crusting easily, which restricts plant emergence. Can we reverse the impacts from tillage and improve soil function? Yes, we can. Minimizing soil disturbance is a good start to rebuilding soil aggregates, pore spaces, soil glue, and soil organic matter. This is an essential step for long term soil productivity. The Journals of Lewis and Clark describe the northern plains landscape as having abundant plant diversity. Numerous species where observed, working together as a plant community to provide forage for large herbivore populations. Our soils where built over geological time in this environment. However, settlement of the plains brought agriculture, which resulted in the polyculture perennial landscape being replaced by a monoculture annual landscape. Where the soil food web use to receive carbon exudates (food) from a diversity of perennial plants harvesting sunlight and carbon dioxide; it now receives carbon exudates from only one annual plant at a time. We can start to mimic the original plant community by using crop rotations which include all four crop types.Diverse crop rotations provide more biodiversity, benefiting the soil food web; which in turn improves rainfall infiltration and nutrient cycling, while reducing disease and pests. Crop rotations can also be designed to include crops which are; high water users, low water users, tap root, fibrous root, high carbon crops, low carbon crops, legumes, and non-legumes to name a few. Warm Season Grass – corn, sudan, and millet. Warm Season Broadleaf – sunflower, and soybean. Cool Season Grass – wheat, oat, barley, and rye. Cool Season Broadleaf – flax, pea, and lentil. Diverse crop rotations mimic our original plant diversity landscapes. They are important to the long term sustainability of our soil resource and food security. Our perennial grasslands consist of cool season grasses, warm season grasses, and flowering forbs. Consequently, adaptable plants are able to grow during the cool spring and fall weather, as well as the summer heat. Allowing for a continual live plant feeding carbon exudates to the soil food web during the entire growing season. Our cropland systems typically grow cool or warm season annual cash crops, which have a dormant period before planting and/or after harvest. 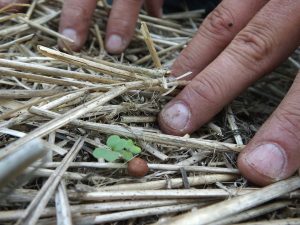 Cover crops are able to fill in the dormant period and provide the missing live root exudate, which is the primary food source for the soil food web. Cover crops may be incorporated into a cropping system as annuals, biennials, or perennials. Starting on a small acre scale will allow farmers and ranchers to find the best fit for their operation. Harvest CO2 and sunlight, providing the carbon exudates to the soil food web. Building soil aggregates and pore spaces, which improves soil infiltration. Cover the soil, controlling wind and water erosion, soil temperature, and rainfall compaction. Catch and release of inorganic nutrients, improving water quality. Wildlife food, habitat and space. Adjusting the cover crop combination’s carbon/nitrogen ratio, to either accelerate or slow decomposition. Animals, plants, and soils have played a synergistic role together over geological time. In recent years, animals are playing a reduced role due to being placed in confinement and fewer farms now include livestock as part of their overall operation. Why do we want to return livestock to the landscape? Fall or winter grazing to convert high carbon annual crop residue to low carbon organic material; balancing the carbon/nitrogen ratio and managing our crop rotation residue for no-till seeding. Spring or summer grazing annual and/or perennial plants with short exposure periods followed by long recovery periods; allows the plants to regrow and harvest additional sunlight and CO2. Reduce nutrient export from our cropland and hayland fields. In lieu of transporting feed to a feed lot, we can reverse the roles and have the livestock graze the material in place. Recycling the majority of nutrients, minerals, vitamins, and carbon. Manage weed pressure by grazing in lieu of an herbicide. Grazing cover crops and/or crop residues allow us to take the livestock off the perennial grasslands earlier in the fall. Extending the grass recovery period and providing a higher livestock nutritional diet. Grazing reduces livestock waste associated with confinement; helping manage our water quality and nutrient management concerns. Allowing cattle and sheep to be herbivores by securing their energy needs from plants. How do we return livestock to the landscape? Winter and fall grazing cover crops and annual crop residues. Summer grazing a full season cover crop, allowing adequate plant recovery, followed by a second grazing during the fall or winter. Winter feeding on hayland fields by rolling out bales or bale grazing. Seed rotational perennials, graze and manage as part of the crop rotation.